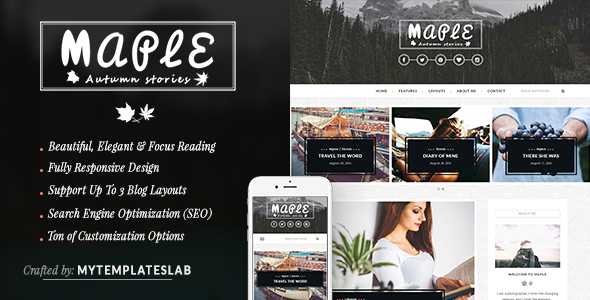 Description: Maple - An Elegant Responsive Blogging Blogger Templates is a bold, beautiful, simple, personal, modern and professional blog ideal for writing your stories. A lot of features and widgets, This theme is 100% responsive so it is compatible with many devices, no need for coding as it is very customizable, also it is search engine optimized. Maple is the theme you will ever need to buy.